In today's blog post, Scott Slovic, co-editor of Numbers and Nerves, writes about his encounter with an Allen Ginsberg poem at a museum in Dhaka, Bangladesh. Among the most ecologocially vulnerable places on the planet, Bangladesh also bears the devastating scars of its 1971 civil war, the scale and brutality of which is hard for the human mind to fathom. How can poetry make emotional sense of vast statistics? Read on. I spent the first part of August 2015 lecturing in Dhaka, Bangladesh, and helping to establish the Bangladesh branch of the Association for the Study of Literature and Environment (ASLE). Bangladesh is one of the most ecologically vulnerable regions in the world, highly susceptible to flooding and rising sea levels and with a large, impoverished population unable to avoid environmentally damaging sources of income that are also hazardous to human health (such as “ship breaking”). I remembered from my childhood that Bangladesh had been the location of terrible human suffering, but I did not recall the specifics. More than anything, I knew about the famous Concert for Bangladesh that former Beatles guitarist George Harrison and Ravi Shankar had organized in New York City in 1971. I did not realize that most Bangladeshis have the year 1971 scarred into their memories. That was the year of the brutal civil war between West Pakistan and East Pakistan that led to the separation of Pakistan and Bangladesh. It was a war fought over “language autonomy” (the right of Bangladeshis to use Bangla, the major language of East Pakistan). The language autonomy movement was spurred in great part by the efforts of intellectuals at Dhaka University, where my conference on ecocriticism was taking place. Everywhere on the campus there are murals and statues and small museums, remembering the efforts and sacrifices of freedom fighters some forty-five years ago. 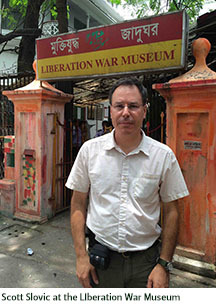 On August 10th, before heading to the airport to begin my thirty-six-hour trip home to Idaho, I went with a student to visit the Liberation War Museum in Dhaka. 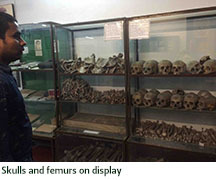 Along with many tattered, yellowing documents, laminated photographs of shirtless men carrying machine guns, and a room full of neatly stacked skulls and femurs in glass cases, there is an open-air, covered walkway on the top level of the simple museum, as one nears the end of the series of exhibits, where international responses to the liberation war are displayed in a scrap-book like array of photographs and documents on the wall of the building. Many world leaders are shown expressing their support for the Bangladeshi people in their fight for freedom and in their time of humanitarian struggle. I learned from this wall of images that President Richard Nixon supported Pakistan during this war, while liberal American leaders, such as Senator Edward Kennedy, were outspoken in their efforts to aid Bangladesh. 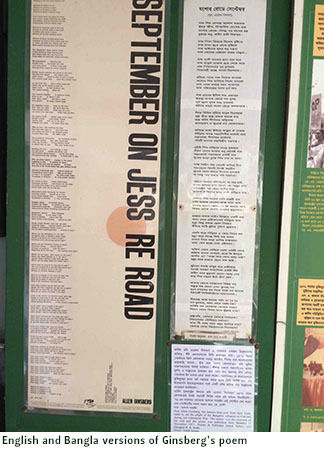 On the museum wall, near photos of Indira Gandhi and other political leaders, there are two long posters presenting both English and Bangla versions of American poet Allen Ginsberg’s “September on Jessore Road,” which details his first-hand experience of the human suffering during the 1971 liberation war. Immediately it struck me that Ginsberg’s poem was profoundly relevant to the Numbers and Nerves project in his effort to convey a situation of vast suffering vividly to people who might be able to help in some way. In fact, one stanza in the middle of the poem exhorts, “Ring O ye tongues of the world for their woe … Ring in the conscious of America[n] brain,” suggesting that the goal of this work is to somehow resonate in the “brain” of Americans and other citizens of the developed world in order to elicit intervention and aid. Readers of Numbers and Nerves are likely to think of many other examples of powerful literature, music, film, and visual art that seek to convey numerical information and inspire individual and collective action. The story of my encounter with Allen Ginsberg’s poem shows that even though I have been thinking about the Numbers and Nerves project for so many years, I continue to stumble across relevant texts that I hadn’t previously thought about. Although Ginsberg’s poem does not do what so many of our examples in the book Numbers and Nerves end up doing, which is to switch back and forth between individual stories and portrayals of “the big picture,” the writer relies in interesting ways on rhetorical questions (which draw the reader into contemplation as he or she tries to answer the questions) and repetition of dizzyingly large numbers (Millions…, millions…, millions). If you go online and listen to the poet recite—or, rather, sing—this work on Youtube, there is a lulling, incantatory repetitiveness to the performance until Ginsberg gets to the final stanza, which he sings slowly and with a kind of agonized emotion, suddenly shifting from numbness to pain. “September on Jessore Road” is powerful demonstration of the effort to communicate the emotional meaning of large-scale social upheaval and human suffering. I recommend that readers of Numbers and Nerves also go online to find the written text of Ginsberg’s poem and recordings of his performance of this work.